Clay Aiken – What Do You Think? In 1997, Clay Aiken was a senior at Leesville High School in Raleigh, North Carolina. 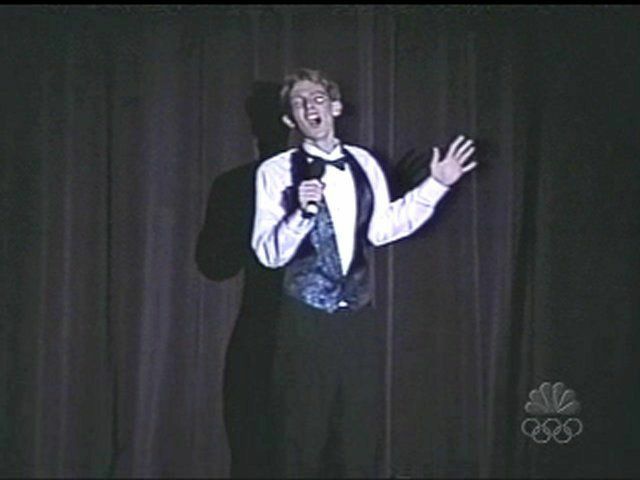 After participating with his school musical organizations for three years, Clay decided to audition as a soloist at Pieces of Gold, the annual arts extravaganza produced by the Wake County Public School System. They only accepted two solo entrants and Clay was one of them. Clay chose to sing This Is The Moment and he earned the only standing ovation of the night. It sounds like Clay has been a musical star for a long time. This Is The Moment is a song written by Frank Wildhorn and Leslie Bricusse. 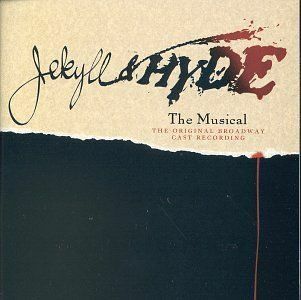 It is one of the most beautiful and pivotal songs from the Broadway musical, Jekyll & Hyde. This is the Moment is sung by Jekyll in the moment he decides to test his formula in himself. In the song he says how he waited for this moment and this is the greatest moment of his life. There is a transition in the stage between Jekyll’s living room and his laboratory, the places where the scene happen. When the song ends, he is at his laboratory, ready to test the formula. On Thursday, one of Clay’s fans found a YouTube of Clay’s performance in 1997. It is exciting to hear young Clay singing with such a mature voice. On June 21, 2010, Clay returned to Raleigh and performed This Is The Moment again for the Raleigh audience. 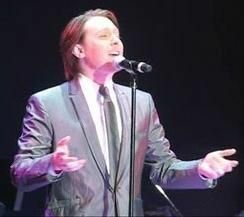 He participated in Bringing Broadway Home, a special benefit concert for the North Carolina Theatre. The program featured five outstanding Broadway stars from North Carolina. Clay sang many songs, but brought the house down with his performance of This Is The Moment. I included both videos because I believe it is interesting to see and hear the differences in the two performances. Clay was wonderful in both performances, but it is obvious that by 2010, Clay was more relaxed and comfortable in front of the audience. What do you think? Did you see or hear any other differences? Thank you so much for the article, Musicfan; and, for posting the two videos. I *think* Clay's vocals were lower in "This Is The Moment" performance 1997 in comparison to the 2010 performance. IMO, the 2010 performance displays the maturation of Clay's vocal range, tone and inflection; and, his artistry as a performer. Have always loved the tonal quality of Clay's lower register and it's on full display in the '97 performance. I noticed also that Clay used some of the same movements in 2010 as he did in '97. 🙂 Love both performances, thank you again for posting them. Yes I did see the difference, he has matured so much and has a voice like no other, I think Jay Leno picked the part of the song that Clay was straining the most, to try to make him look unprofessional . seeing the whole thing proves that is not the truth. I am getting sick of people saying what a short cut he took, He worked his heart out in school learning his craft, what do they want from him…He is and always be the best of the best, there are far to many people that feel the way I do, for it not to be the truth. Wow! Musicfan, my insomnia paid off! What a wonderful find. A great exercise in compare and contrast… I love 1997 Clay's lower register certainly, but I have to admit that the 16 years experience added much to Clay's stage presence. I love them both. We would not have had the 2010 version if 1997 had never happened. Oh oh, I can't see the video's musicfan! Although I've already seen this new/old one last night for the first time it's a bummer they aren't visible here on your blog. I still have the old/old version of the song where somebody spliced together the ending.. by subrutering, lol! I know I spelled that wrong, but y'all know what I'm talking about. MAN what a voice at 18 years old!!! gaymarie…I wonder why you can't see the videos…no one else has said they can't see them. I will try and see if I can figure out why you can't see them!! How weird! It's now visible for me! Heck, that was 12 hours ago too….I just needed to catch up!!! I love them both! I cannot choose. Both version are a powerhouse and an incredible performances. bumps" happen – I love watching and hearing the old songs from before Idol – this one is no exception! Yes there is a difference, but both very enjoyable , Clay 15 year after is so well seasoned!! That was beautiful! enjoyed both videos, Clay has such a powerful and beautiful voice, I think as he matured his voice got better. Thanks Musicfan xox. In the 2nd one Clays voice is more powerful and mesmerizing. My insides felt like they were melting just like the Atlantic City Christmas Concert.Like the 2 women behind me said OH LAWD! THAT WHITE BOY SURE CAN SING!!! Loved the lower register, needs to record more songs that show off that register. The are both just fantastic! There is difference of course but the are both show off Clay’s dynamic voice. Thank you for showing both videos. I love both of them. I love Clay's voice. It is such a treat to see Clay(ton) singing as a senior in H.S. Have only see a brief clip of this before. In the 2010 clip Clay turns and mentions Terry. Is that Terrance Mann? I've heard him talk about how Clay performed in some stage plays in Raleigh that he directed. Did I see Terrance Mann as a nominee in one of the categories of the Tonys this year? Simon Cowell was right when he said Clay had a voice for Broadway (although Simon meant it as a putdown). I love both renditions. The 2010 version is definitely more mature vocally. Clay sings it with a smoother delivery and I seem to hear an added subtle lilt in his voice. Clay also appears more confident about looking into the 2010 audience. Either way – Clay certainly knows how to please an audience when he sings, as evidenced by their resounding approval following his last glorious note at each appearance. Glad the earlier version has come to light, as it shows how wonderfully Clay has matured with age – both vocally and visually. I loved both performances…but, he has certainly matured and has such a stage presence now. I just love listening to him sing any time. No one sings quite like Clay does. Thank you for putting up both clips. I have listened to them both numerous times, but never one after the other. I could listen to either quite happily, But in the newest one he has matured. He seems to have more confidence, or finesse, or whatever you want to call it. I will never tire of this song. I loved both performances, but Clay's voice and stage presence to date is amazing. Being only 18 when the first one was done, he sounded wonderful. When I watch the latest version, I could watch that all day. He just carries himself so well on stage. Not only the voice, but the phrasing, and he makes it look so darn easy…which we know..it is not. Everything he has done has lead him down this road to where he excels today. It's been the best 10 years EVER!!!! Thanks Musicfan. Error: Error validating access token: Session has expired on Tuesday, 21-Aug-18 16:13:01 PDT. The current time is Thursday, 25-Apr-19 17:36:42 PDT.